Like flares, Neil Young, wild hair and a laid-back attitude, the VW Kombi van is a legend of the 60s and 70s - representing freedom, adventure, travel and general escapism. Like it's predecessor, the Volkswagon Type I, the Beetle, the Type 2, the Kombi, is a cult classic among cars and was the inspiration for a new style in transportation -ie; the cargo, passenger van. The Kombi story dates back to 1950, when the first generation Kombis or Microbuses were produced by Volkswagon. These early model Type 2's had a distinctive split windscreen and were produced until 1967 and in '68, the single windscreen took over. 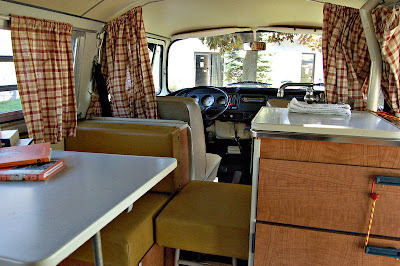 Early Camper Box variations were built by Westfalia, the offical VW camper converter, from 1951 until 1958. From 1958 the SO (Special Model) campers were introduced. According to the Westfalia website, in the 50s and 60s many US servicemen returning home, brought back these campers from Germany. In the middle decades of the 20th century, caravanning was really taking off and the VW camper vans were a neat and innovative alternative. !967 VW Kombi. Peace man. In the 1960s and 1970s the Kombi became an iconic counter-culture symbol, representing freedom and the rejection of staid, stay-at-home conservatism. Customised hippie vans began to appear on the roads, covered in peace-loving symbols and colourful psychedelic swirls. Kombis still have a loyal fanbase -the Australian Kombi Club has 5000 dedicated members. In recent times, its retro appeal has made it an even more desirable set of wheels. Every year the the October, the Old Bar Beach Festival , which celebrates Australian beach culture, features an impressive line-up of iconic Kombis. The festival actually holds the record for the most Kombi/Transporters lined up in one area - there's a Kombi swap meet and a chance for owners to mingle and exchange transport stories over music and a BBQ. A Kombi lovers paradise. Kombis lined up at the Old Beach Bar Festival. Image from the website.